On behalf of everyone at Sports Agent Blog, our hearts and prayers go out to Paul Lawrence’s family, co-workers, clients, and friends. 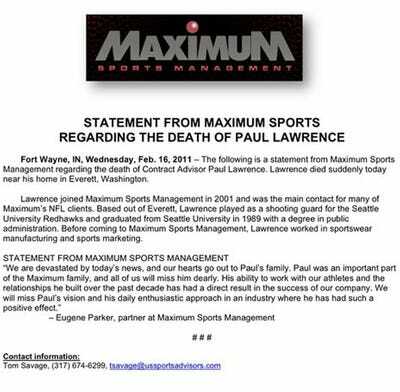 Lawrence reportedly passed away earlier today near his home in Everett, Washington. Lawrence had been a Contract Advisor at Maximum Sports Management, the agency that represents NFL stars including Larry Fitzgerald, Tracy Porter, Ndamukong Suh, Hines Ward, Greg Jennings, and many other fantastic NFL players. He was a shooting guard at Seattle University and remained a big part of the city thereafter, even trying to keep the Seattle SuperSonics in his hometown. This post originally appeared at Sports Agent Blog.